Edward Humphrey was born in Horbury in early 1887, the second son of malster John Edward Humphrey (born Lincolnshire) and his wife Alice (nee Johnson, born in Horbury), who had married in the Driffield Registration district in 1876. In 1891, John and Alice are living with their three sons in Great Driffield. Edward’s siblings are Charles Winterburn Humphrey, born 1880 in Horbury, and Frederick Humphrey, born 1890 in Great Driffield. The birthplaces of the children suggest that the family moved from Horbury to Great Driffield between 1887 and 1890. By 1901 the family, with the addition of a fourth son, William, born 1895 in Wakefield, have moved back to Yorkshire and are now living at Sandal Magna, Wakefield. John Humphrey is working as a maltster’s labourer and describes himself as married, but his wife is not recorded in the household on the day of the census. The eldest son, Charles is also now working as labourer for a maltster and Edward Humphrey, now 14 years-old is working as an errand boy. Alice Humphrey died in the early winter of 1911. On the 13th June 1908, Edward married Emma Clayton of Ardsley at Ossett Holy Trinity Church. Edward’s address at the time of his marriage was 48, George Street Wakefield whilst Emma’ s address was Ryecroft Street, Ossett which, in 1901, was also her parent’s address. In 1911 Edward, is now working as a house painter and paper-hanger and the Humphreys are living at 46, Charles Street, Wakefield with their two young sons Clifford Leslie, (1909–1982) and James (Jimmy) Frederick (1910-1959). Both boys were born in Wakefield and in 1912 a third son, George Edward was born (died 1984). Edward Humphrey first enlisted as Private, 15099, in the King's Own Yorkshire Light Infantry on the 30th of August 1914, but transferred to the Royal Naval Volunteer Reserve on the 7th of September 1914 as part of Collingwood Battalion. 'A' Company, 2nd Platoon. On the 4th of February 1915 he transferred to Hood Battalion. His service record reveals that he suffered with jaundice between the 8th June 1915 and the 21st October 1915 before being invalided back to the U.K. on the 25th November 1915. He was drafted for the British Expeditionary Force (BEF) on the 9th July 1917 and rejoined Hood Battalion on the 5th August 1917 and was fatally wounded on the 9th October 1917. His next of kin was given as Emma Humphrey, 9 Haigh Row, Thornes Lane, Wakefield, Yorkshire. 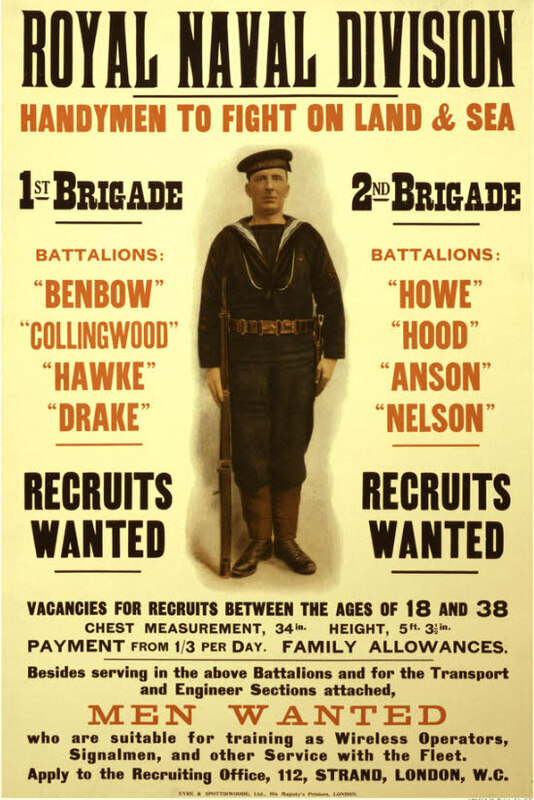 The Royal Naval Volunteer Reserve (RNVR) was composed primarily of men who had no direct contact with the sea, yet signed themselves as willing to serve in the Navy in the event of War. Some of these men served at sea in the Navy proper, most usually on coastal motor-boats etc. In 1914 the Navy had more men than available ships, so upon mobilisation at the outbreak of war, the Royal Naval Division (RND) was formed from this surplus, mainly RNVR, to augment the Army numbers. In keeping with their naval roots, their battalions were named after famous Admirals. Edward Humphrey was in the Hood Battalion and saw much service on the Western Front as part of 63rd (Royal Naval) Division. The 63rd (Royal Naval) Division was established in August 1914 and by April 1915 it was known as 2nd (Royal Naval) Brigade. In July 1915, the Brigade was broken up. It reformed on 2 August 1915 and was re-designated 2nd Brigade. It was further re-designated the 2nd (Royal Naval) Brigade on 7 July 1916, and on 19 July 1916, became 189th Brigade. The 7th (Hood) Battalion joined 1st Brigade on the 2nd of August 1915 and rejoined in July 1916. 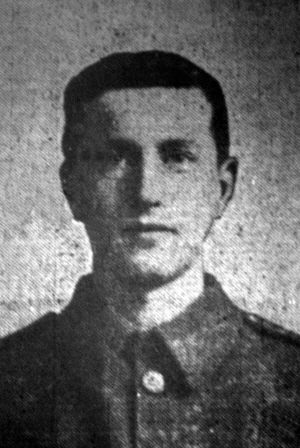 Edward Humphrey died of wounds on the 10th of October 1917 at the 4th Casualty Clearing Station from gunshot wounds to the neck and chest, which he suffered the day previously. Hood Battalion had been preparing for the forthcoming battle at Passchendaele by providing endless working and carrying parties and camp-building at La Brique camp from the 8th of October, moving to Brake Camp on the 20th of October and to West Side Canal Bank on the 24th of October. During this period in support the Hood Battalion lost about a dozen men to German bombing and shelling, most probably including Edward Humphrey. Emma Humphrey never re-married after the loss of her husband and at the time of her death in November 1963, aged 77; her address was 17, Lockwood Avenue, Mirfield. Emma was buried at Ossett Holy Trinity on the 19th November 1963, 55 years after she married Edward at the same Church.